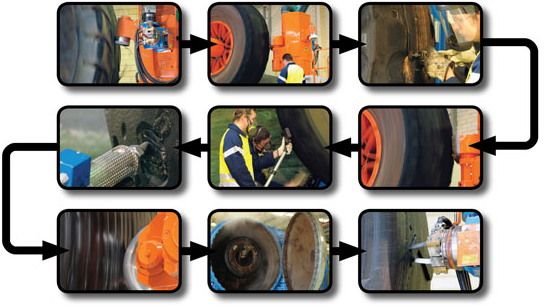 Due to technological advancements, Tytec has a state of the art system for retreading OTR tyres. 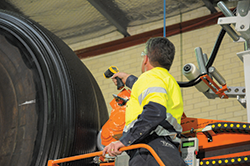 Tyres produced using this system are detreaded, buffed, built, and the tread designs cut on air inflated computerised modules. These modules are fully automatic and controlled by a C.N.C. computer, which can store up to 600 programs and is designed for complete interface of the buffing-building and cutting procedures. This system ensures that your tyres are retreaded to precise diameter and tread depth specifications. With Tytec field engineers conducting heat studies on our retreads we are continually changing rubber compounds to build you a retread that will continually improve your cost per hour. We also have the ability to tailor design tread depths and pattern designs to tailor build a retread for your application again improving your cost per hour. Extend the life of your tyres.